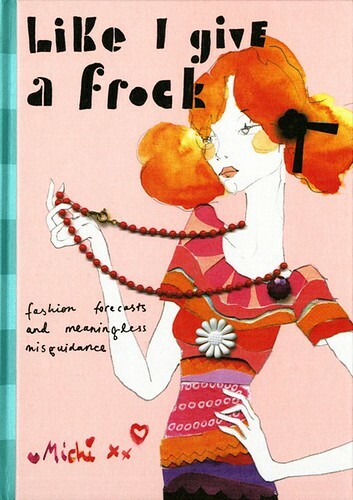 How fun is this book Like I Give a Frock: Fashion Forecasts and Meaningless Misguidance by Michi Girl? “Meet Michi. She’s sometimes stylish and sometimes tragic, but she always knows best. She’s sharp and funny. (And maybe just a tiny bit opinionated.) She’s just a shopping queen, weather-watcher and quite possibly the best advice-giver you’ve ever met. available through Penguin Au. Let me know if you see it someplace in the states. Thanks to Into the Fray for posting about my “I Make Things Poster“, available here. Ooh. I love the name and I love the illustrations. Her work is mixed media and so interesting. I love it. What a fun book. I may just have to order it from Australia! The book sounds delightful–I couldn’t agree more about the track suits. And you’re very welcome! I do really love it.